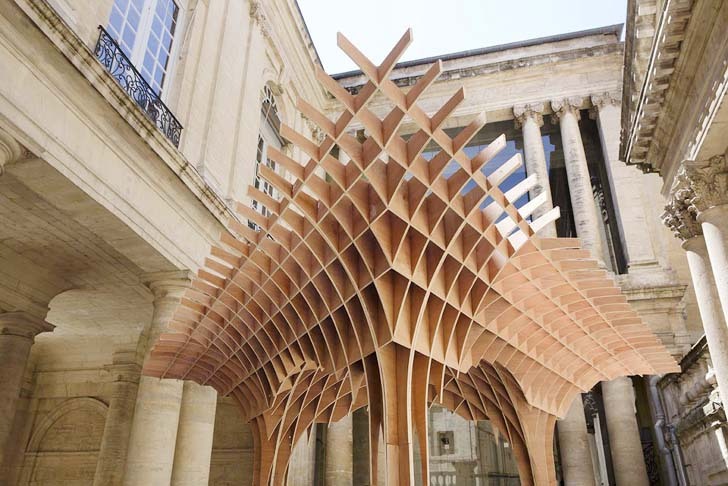 Visitors at this year’s Festival des Architectures Vives FAV in Montpellier, France will have a chance to check out Robin Juzon’s elegant wood “waffle” pavilion, which will function as an info-desk and reception area. The simple geometry and patterns of the intersecting wooden panels create an interesting structure that alternates between transparency and opaqueness. Two pavilions were made for the Festival des Architectures Vives. The first, by Robin Juzon is located in the heart of the city, in the courtyard of the CCIT Montpellier (the Chambar of Commerce and Industry), Hotel Saint Come. The second one, designed by David Hamerman, was installed in front of the new Office of Tourism in the city of La Grande Motte. The structure of the first pavilion resembles the vaults of the old existing chapel in the city center, and it’s designed to serve as a meeting place and a forum for visitors. The pavilion’s simple shape is achieved by using thinly sliced wooden panels. As visitors pass the pavilion appears to shift from an opaque structure to a transparent one, depending on the angle of viewing. 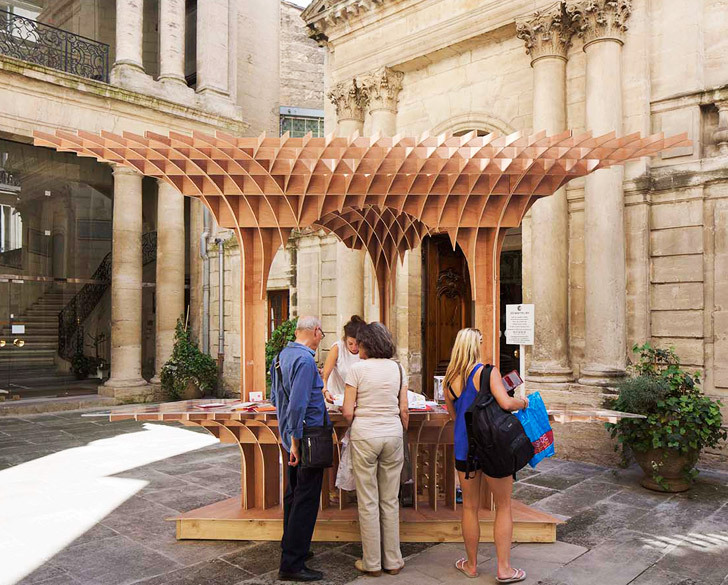 Two pavilions were made for the 2013 Festival des Architectures Vives. The first, by Robin Juzon is located in the heart of the city, in the courtyard of the CCIT Montpellier (the Chambar of Commerce and Industry), Hotel Saint Come. The second one, designed by David Hamerman, was installed in front of the new Office of Tourism in the city of La Grande Motte. The structure of the first pavilion resembles the vaults of the old existing chapel in the city center. The pavilion’s simple shape is achieved by using thinly sliced wooden panels. As visitors pass the pavilion appears to shift from an opaque structure to a transparent one, depending on the angle of viewing.